Situated in a secluded & affluent part of the ever popular family resort of Coral Bay, Villa Rafaella is a private paradise surrounded by stunning green citrus fruit orchards, affording beautiful views of the glistening (turquoise) Mediterranean Sea. 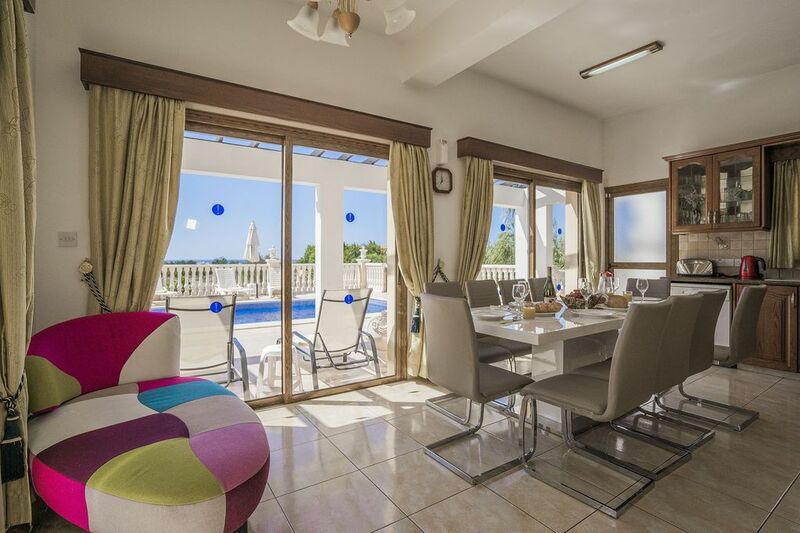 Rafaella is a charming Cypriot designed villa, characterised by Palm Trees, stone balustrades and wooden pergolas in a peaceful location that is easily reached from amenities in Coral Bay. Shops, bars and restaurants are all within easy (and flat) walking distance. Corallia Beach is only 1km from Villa Rafaella and if you fancy indulging in some water sports such as jet ski-ing and paragliding or taking a spectators spot in one of the beach cafes with a cold beer, Coral Bay Beach is only a 10-15 minute walk away. The main strip is just under 2km away (to its heart) as is the large Philippos hypermarket which will deliver both you and your shopping home without charge upon request. Accessed from a long gated driveway, the two storey villa has a real sense of space and seclusion and is fully furnished in an elegant style with all modern conveniences. The villa has fully functional A/C throughout the bedrooms and fitness room. It has 5 bedrooms, 4.5 bathrooms, (3 en-suites, a shower room and Cloakroom/WC ), sleeping 10 (one or two infants extra would be permitted). The very spacious & beautifully decorated ground floor area features large open plan lounge/kitchen/dining room with an elegant dining table seating 10 and situated next to French doors leading to the outside pool area. Other amenities include a private swimming pool with sea views, gazebo with outdoor dining area, stone built BBQ, private indoor gym, complimentary (fast) Wi-Fi, Large Flat Screen TV in the lounge with Satellite (English speaking channels) & DVD and all the comforts you need to make this your home away from home in the Cyprus sunshine. The villa can accommodate up to 10 people comfortably, so gather your friends and family and start planning a dream vacation to the mythical island of Cyprus. As you enter through the main double doors to the villa you are greeted by a glistening marble staircase and floor which features a stunning mosaic design. Adjacent to the staircase you will find a beautiful open area which benefits greatly from natural light due to the grand windows and patio doors leading outside. The stylish lounge is complimented by a chic modern two piece suite, black glass coffee table, flat screen TV with satellite, DVD player and 1990's retro stereo system. All in all, an excellent space for relaxing with your favourite bottle of wine after a long day at the beach (or by the pool). Walking past the impressive stone built fireplace you will come into the open dining area and kitchen. This is a wonderful space, full of natural light, with 4 sets of French doors leading to the outdoor pool area. The dining area features a classic chaise longue and a large dining table with ten leather chairs and offers beautiful views of the pool and surrounding orchards. The fully equipped kitchen is spacious and has all modern amenities including a dishwasher, large fridge-freezer and microwave and modern coffee maker. There is an electric oven, extractor hood and gas hob. Just as we leave the kitchen we will pass the utility/laundry room complete with the washing machine, cupboards, sink and accessible back door for your convenience. Moving to the east part of the villa you will come to the private indoor gym. The air-conditioned gym is complete with a running machine, an exercise bike, ankle weights, X-trainer mat and two medicine balls. There is also a large set of patio doors leading outdoors for those in need of a refreshing dip in the pool after a stimulating workout. As we leave the gym we will come to the two ground floor twin rooms Both rooms are fresh and tranquil, featuring large built in wardrobes and bright patio doors leading to the rear private veranda which are surrounded by luscious greenery and views of the mountains. The ground floor shower room is next to the twin rooms and is accessed from the hall. Moving upstairs we will arrive at the large open landing which features two relaxing chairs. To the left there is a set of patio doors leading onto the western balcony. The other three doors lead to both the master and double bedrooms. The master suite is a beautiful boudoir and features a king sized bed, large built in wardrobes, dressing table and mirror, en suite Jacuzzi bathroom, and two sets of patio doors leading to north and south balconies. The double bedrooms, like the master, have large built in wardrobes and en suite bathrooms. They too have French doors leading out to a large southern balcony with offers wonderful panoramic views of the Mediterranean Sea and glistening horizon. A travel cot and highchair can be supplied on request. Air-Conditioning included in rental price (bedrooms and fitness room) (Lounge area paid extra at 10 euros per day if required). As you enter the grand gated driveway you will notice a shaded car port to the right of the property where there is a table tennis court for those friend and family tournaments. Walking around the side of the villa you will come to the stunning pool area. There are ten sun loungers with two parasols and pergola surrounding the sparkling 9m by 4m pool (lit to perfection at night). To the left of the villa there is a large outdoor dining area sheltered by the beautiful, traditional stone built gazebo featuring white drapes giving it a special Cypriot old worldly charm. In the same secluded area you will find the large authentic stone BBQ to assist with alfresco dining. A truly beautiful spot for taking in the sunset as it glistens through the palm trees. Moving upstairs again you will find the upper balconies. The large southern balcony which is accessed by both double bedrooms feature a table seating six and offers spectacular views of the ocean and coastline. The master suite is blessed with north and south facing balconies. The southern balcony has a set of two wicker chairs and table and is completely secluded for those wishing to have a romantic glass of wine whilst watching the sun set on the horizon. The northern balcony offers a beautiful view of the mountains and is a perfect spot for star gazing. Blazing Saddles Bar was nice, few games for the children (air hockey, pool etc). Fat Mamas is a must for anyone visiting Paphos, food and entertainment is brilliant. Coral Bay beach was good also for water sports and bathing alike. I would also recommend a jeep safari tour as a great way to see the island and a few select locations. Very satisfied with your service. Lots of communication before our trip and answered any and all questions we had. We had a small issue when the power went off one morning, I called them up and they resolved it very quickly, they were very friendly and helpful. ''The Villa was fantastic, we were very impressed. was very clean and well equipped especially in the kitchen, plenty of plastic glasses and plates useful for the pool area and the children in our party, would certainly recommend the villa to others. The location was lovely, very secluded although we did find we had to take taxis everywhere as we had young children in our group and the distance to walk in the heat (not complaining about the weather it was glorious) would have been to much for them, in hindsight we should have hired a seven seater vehicle. We did visit the Italian restaurant you kindly recommended and gave us vouchers for, Duomo I think the service and food was outstanding, best meal we had in Cyprus. Water Park was a great day out and well worth the money. Andy's Taxi Service a godsend, and such a nice guy. The service we received from yourselves especially you Steven was second to none, I can't thank you enough for all your assistance, it is the first time I have arranged a family holiday on line and not through a Travel Agent was very concerned but you made it so easy. Thank you again. When we arrived we had requested two high chairs and there was only one, also one of the air conditioners dripped through the whole first night, when I called this through to the local Manager I was very impressed when a gentleman Chris I believe arrived within a couple of hours with the second high chair and arranged to have the air con fixed that same day. Great Service. Absolutely amazing villa. Clean and well kept. We had a small issue when the power went off one morning, I called them up and they resolved it very quickly, they were very friendly and helpful. As we arrived late at night the villa owners / managers had put some food in the fridge for us which was a lovely touch and helped us out massively. Thank you for helping make our holiday enjoyable, please also pass our regards on to the villa owners / managers who were brilliant. Photos obviously were when the villa was first advertised with you. Power on/off for the first 2 days so 140euros of shopping had to be discarded, as it thawed or wasn’t kept chilled . Air con not working as power not on. Kitchen poorly equipped, ie not adequate serving dishes, needs more cups/mugs . one sunbrolly dangerous as wind kept blowing it over. 3 pin plug sockets but some bedside lamps have only 2 pins ? Feel this is dangerous. Requested not to use certain suntan lotion because of staining, but sunbeds quite stained, seat pads on outside chairs stained, half the ties broken , no tie backs on outside table curtains , they were dirty and just tied in knots. We had a resident mouse under the sink, who left droppings on the lounge seats. Rats roaming outside when we were eating. We also found coackroachres in the laundry room on our towels. When we had no electricity we were told that’s we could ask for candles ? The pool had green stains on the sides when we arrived, thought that this would be cleaned during the week.only saw attendant clean bottom. One hairdryer for a villa that sleeps 10 !!! This has been a disappointing holiday for us . I have had many villa holidays in the past and feel that this one is definitely not on par. My recommendation is that the villa is updated. Or sold at a lower fee. Please feel free to contact me at any time. This is a lovely villa with everything you need to have a wonderful holiday it is kept beautifully clean inside and out. From the moment you book Steven and Andreas make sure your holiday goes without a hitch, Andreas is always on hand should you need a taxi or information. The villa has a beautiful pool with plenty of sunbeds and umbrellas, we were a family party of 8 adults and 3 children and and the villa was very well equipped it is situated in a quiet part of coral bay but still within walking distance to the beach and shops. I would definitely come back , we had a fantastic time. Wir hatten alles in Allem eine tolle Zeit. Der Aussenbereich ist sehr gemütlich und grosszügig, der Pingpongtisch gut geschützt vom Wind. Aber die Schläger sind sehr verbraucht. Das Wasser lief in den Duschen/Bädern sehr spärlich, Haare waschen fast unmöglich, bzw. Duschen ohne Vorhang umständlich. Zudem hatten wir viele Ameisen im Haus, konnten sie aber mit Sprays vertreiben. Die Küche ist auch nicht super ausgerüstet. Nur wenige richtig grosse Weingläser, zu wenig kleine Teller, keine scharfen Messer. Schlussendlich sind das alles Kleinigkeiten, über welche man gut hinwegsehen kann und unseren Urlaub nicht wirklich trübten. The blue flag beaches of Corallia and Coral Bay with soft sand and crystal clear waters are within a 10-15 minutes walk from Villa Rafaella. Coral Bay's main street of shops and restaurants is also within walking distance (1.9km), making this one of the most conveniently situated holiday villas in Coral Bay. In the summer Coral Bay has an excellent choice of restaurants, bars, and night clubs if you want to dance the night away. Practical amenities like medical centre, pharmacy and other services are all present in the area. An excellent bus service takes you from Coral Bay into the town of Paphos with its historical harbour, gift shops and restaurants. Also be sure to visit the 'Old Town' of Paphos with its blend of high quality shops and traditional markets. Can't be bothered with the bus? Taxis are readily available 24 hours a day in Coral Bay. Things to do in the Coral Bay area include many watersports on the beach at Coral Bay, diving, PaphosZoo, horse riding, visiting the protected Akamas Peninsula and Lara Beach Nature Reserve (famous for turtles), hiking/walking, buggy safaris, 4 x 4 safaris, the Sea Caves and Agios Georgios area, sailing and many more. From Coral Bay the amusements in Paphos and renowned Paphos Aphrodite Water Park are also easily accessible, as are numerous archaeological ruins in Paphos such as the Tombs of the Kings and Paphos Archaeological Park. If you want to get out and explore Cyprus' fantastic scenery, take a trip to the Akamas Peninsula, Polis, Latchi or even the Troodos mountains. The Akamas is an untouched part of Cyprus with unspoilt coastline and traditional fish taverns in stunning seaside locations. 4 Golf courses can be found in the Paphos region. They are Minthis Hills, Secret Valley, Aphrodite Hills and Elea. All are within 30-40 minutes drive (approx) of Coral Bay.